ระบุวันที่และเลือกโรงแรมและที่พักอื่น ๆ จาก 90 แห่ง! Hotel Central features free WiFi and views of city in São Tomé. This 3-star hotel has air-conditioned rooms with a private bathroom. Extremely friendly and helpful owners and staff. Very intimate "boutique" hotel, recently renovated. Fantastic value for money. SH Boutique Hotel is offering accommodation in São Tomé. With a shared lounge, the 4-star hotel has air-conditioned rooms with free WiFi, each with a private bathroom. I have travelled to Sao Tome from London a few times and widely within the island as well as stayed in a variety of hotels/resorts including Pestana Hotel (5 star), but none of the experiences have been as perfect as the experience we encountered at SH Boutique Hotel. The bespoke and very tailored service/treatment was phenomenal. All staff members are absolutely well trained and welcoming. The rooms are very clean and tidy. The cocktails at the bar are brilliant as well as the hair salon and the restaurant within the hotel. Everything about SH Boutique Hotel is perfect and very peaceful. The hotel is very well located - 10 minutes maximum from the airport, a 2 minute walk to the city centre and just a walk away from the sea/beach. Please note that the island is small and most destinations are just a walk away. I HIGHLY recommend SH Boutique Hotel to all of those looking for a family friendly space and hotel, business travellers or just for leisure as this space is also VERY affordable including all the extra services. I will definitely return. Featuring free WiFi throughout the property, Sundy Principe offers accommodation in Santo António. Extreme contact with nature and local communities, haute cuisine, exceptional service quality and very good value for money. Wonderful and spacious tented villas, top-of-the-edge restaurant design, with a surrounding tropical forest, by the blue&green sea. Offering an outdoor pool and a restaurant, Roça Belo Monte Hotel is located in Santo António. Free WiFi access is available. At Roça Belo Monte Hotel you will find a private beach area. Loved it, memorable trip! Awesome view, great accommodations, good food, helpful and friendly staff. 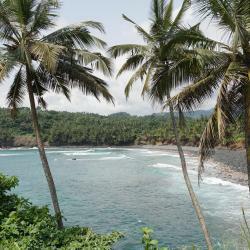 Offering an outdoor pool and a restaurant, Hotel Praia is located in São Tomé. Free WiFi access is available. Each room here will provide you with a TV, air conditioning and a balcony. Garden and the best swimming pool in Sao Tome. Located in the Gulf of Guinea on the island of São Tomé and Príncipe, Hotel Miramar by Pestana offers an outdoor swimming pool, terrace with sun loungers and a garden. This is my second stay. It hadn't changed much. Pleasant staff, neat rooms, comfortable beds. The pool was ever neat and lovely. Featuring 3-star accommodation, Residencial Mira Rio is set in Santo António, 8 km from Zona Ecologica Principe Ecological Zone and 5 km from View on Jockey Cap. Prince Residencial offers air-conditioned accommodation in Santa Joaquina. All rooms boast a flat-screen TV with cable channels and a private bathroom. Boasting a garden and terrace, Residencial Nova Arca de Noe is located in Santo António, 11 km from Zona Ecologica Principe Ecological Zone. Offering a restaurant, Hotel Residencial Avenida is located in São Tomé. Free Wi-Fi access is available. Rooms here will provide you with a TV, air conditioning and satellite channels. Bonus to find the staff spoke english and were very helpful, as this is a portuguese speaking town and it’s our first visit. Good food served at the restaurant too! 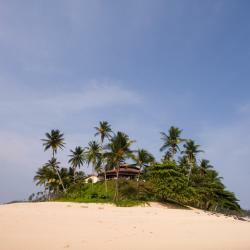 Located in Praia Campanha, Makaira Lodge provides accommodation with free WiFi and a private beach area. A terrace with sea views is offered in every unit. While the lodge is secluded on its own tropical beach, it has all the comfort and the facilities one could need during holiday. There are 5 few safari tents for guests which are furnished very nicely, like cute comfy apartments. There is a mini bar, coffee machine, even a dehumidifier in each tent. The managers, Carina and Stan are super helpful and the staff as well. The tours they offer are interesting. We did a tour of the island in the Ranger car, with a picnic lunch in Terreiro Velho, towards the south. The guide spoke very good English. They also organise guided hikes, just ask for the list of the tours. The location is beautiful ! the beach lovely, sandy and surrounded by wild jungle. One can take a walk in the forest on a marked path along the coast to reach the next beaches. We did that walk as a day tour and I strongly recommend it. The price included half board and the meals were good. Offering a restaurant, Mucumbli is located in Ponta Figo. Free WiFi access is available in this lodge. The accommodation will provide you with a balcony and a seating area. Gracias Tiziano, a ti y al equipo de personas que hacen posible Mucumbli, por vuestra hospitalidad. Y un abrazo enorme a Ildo por habernos mostrado un trocito de vuestro país. 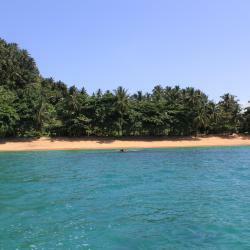 Set in São Tomé, Damole Guest House offers accommodation with free WiFi and a garden. All units feature air conditioning and a flat-screen TV. A balcony with garden views is offered in every unit. Situated in Santa Cruz in the Sao Tome Island region, Suite Na Praia de Micondo features a terrace. This lodge features a garden as well as free WiFi. Located in M. Peixe, Residêncial Tamarindos features accommodation with air conditioning and access to a garden with a barbecue. Free WiFi is available. 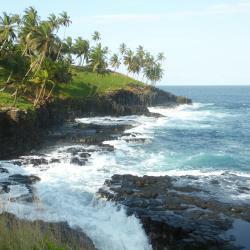 This is a really nice place to stay if you want to discover northern beaches of São Tomé. Cláudio made our stay very comfortable at any moment, from the arrival to departure. He was always available for anything needed. The room was clean and comfortable with air conditioned that we did not use. Dinners were good value for money. 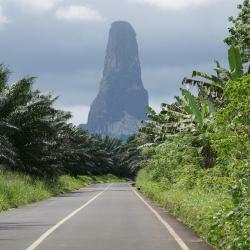 All in all, the perfect stop to discover north and west São Tomé.